July was a great month with our big family vacation down to the Cayman Islands. Think 23 people, including our daughter, all going down there and having a blast. It was so much fun that my wife and I are trying to see if it'd be feasible to move down there! Ha!...Kind of. While the vacation/relaxation/family time was great it was also nice to see our investments continuing to work for us and pay out dividends. My FI Portfolio produced $280.44 in dividends during the month while my FolioFirst portfolio added another $11.69. My Roth IRA chipped in another $40.39. Across all 3 accounts I received a total of $322.52 during July. As I mentioned above my FI Portfolio produced $280.44 in dividends last month. On the surface the quarter over quarter comparison is rather disappointing at -8.0%. Although upon further inspection the discrepancy is due to Wal-Mart (WMT) paying a dividend in April but not in July. Adjusting for that moves the quarterly comparison up to a 3.2% increase compared to April. I put more focus on the year over year comparison since companies typically don't change the timing of their payouts, although it does happen. This allows for a cleaner comparison from year to year. 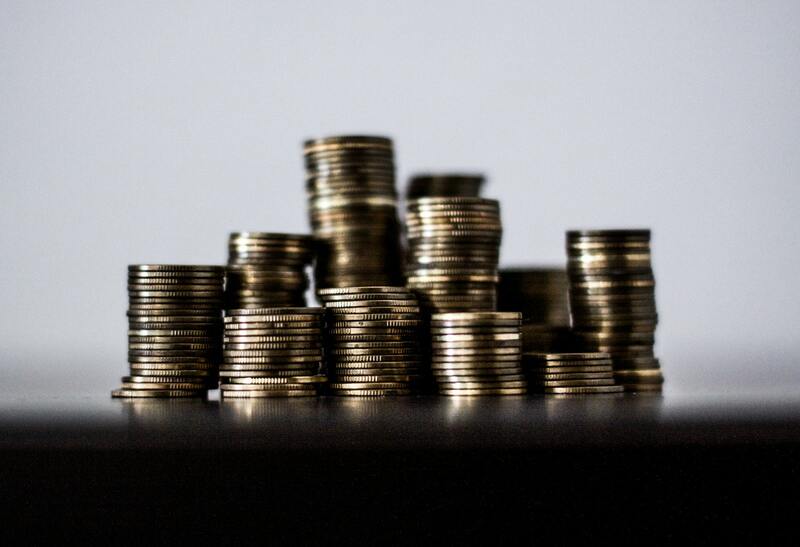 Compared to July 2017 dividends received showed a healthy 11.0% increase. My Roth IRA showed a solid 3.3% increase compared to April's dividend total of $39.10. The year over year increase was quite impressive too at 13.8%. What's really great to see though is that these changes are solely from dividend raises and reinvestment and not from new capital being deployed. The pay raises just keep on coming. July saw another 5 dividends being raised up among my FI Portfolio positions. You mean a company I own a piece of, albeit tiny, wants to pay out more of their profits to me just because I own part of the company? Sign me up! 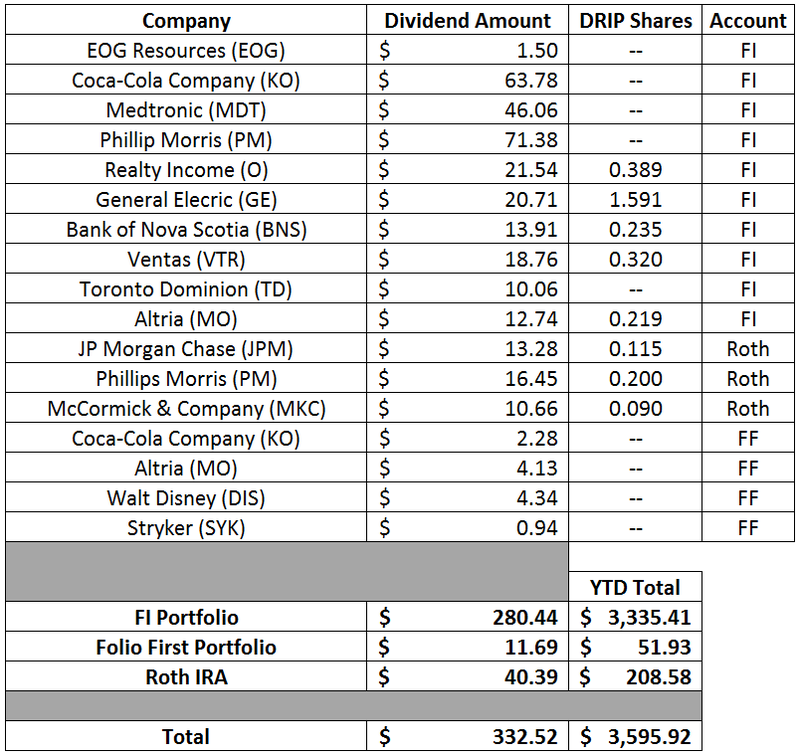 Combined those 5 companies boosted my forward 12-month dividends by $39.52. Through the end of July I've had 38 announced raises from 36 of the companies that I own combining to increase my forward 12-month dividends by $343.56. My forward 12-month dividends for my FI Portfolio ended June at $6,398.98 while my FolioFirst forward dividends are at $87.01. That brings the total taxable account forward 12-month dividends to $6,485.99 My Roth IRA's forward-12 month dividends increased to $371.75. Across all 3 accounts, assuming no dividend cuts or position size changes, I can expect to receive at least $6,857.74 in dividends over the next year. The rolling 12-month monthly average for my FI Portfolio is at $495.37 per month which is a decent $22 above 2017's monthly average of $473.37. This should continue to increase throughout the year assuming no dividends cuts. How was your start to the second half of 2018? Cayman sounds like a lot of fun. I would like to go there with my family to veg out one day. Looks like your portfolio is still rockin' on! Many great names paying you as usual. Stryker is a company I looked at a long time ago but never pulled the trigger. I like their biz. MKC is another I wouldn't mind adding to my portfolio one day too. Thanks for sharing. Cayman was awesome and I highly recommend going if you can. Where we stayed it was probably a bit expensive for one family to do but we also had one of the best stretches of 7 mile beach about 30 yards from the door. The location was great with the grocery store about 3/4 mi away so there's definitely ways to reduce the food cost of the trip. All in all it might have been a bit expensive but I wouldn't trade that time/experience back for the money. I really like SYK in the medical device space and hope to build that position up into a real position rather than the small position that it is right now. MKC is a decent size position for me although I'd really like to bump the share count up for my holding but not at the current prices. So DRIP on and wait is the plan there. Great to see those dividend raises continue to come in, JC. You've had quite the steady stream! I'd like to add JPM, MKC and/or DIS to my portfolio. There's definitely been lots of increases this year and even better is that they've been coming in stronger than I expected going into 2018 which is a pleasant surprise. MKC and DIS are 2 companies that I really want to increase my positions in. That’s a solid $300 beat. I really like your diversification; what a nice basket of quality names! Your 11% growth number is inspiring. Hopefully you can maintain this number. It wasn't the best I've ever done but considering that was primarily from dividend raises I can't complain about that YoY increase. It looks like organic dividend growth won't hit the double digit mark for the entire portfolio, but that's largely because the higher yielders are also slower growers and therefore have a large drag on the weighted growth rate for the portfolio. However as long as I'm routinely 5-6%+ for the weighted growth rate I'll be more than happy with those results. The dividends and results continue to impress JC. I've enjoyed reading your monthly posts and watching your progress/growth. Keep up the great work.